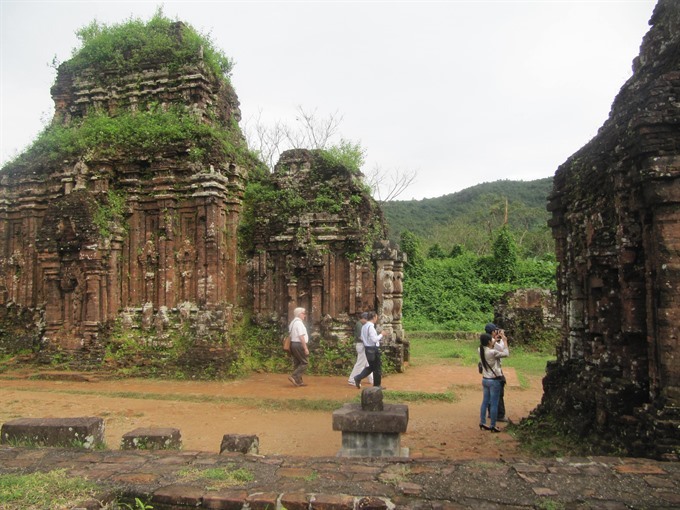 The central province, in co-operation with the Institute for Conservation of Monuments under the Ministry of Culture, Sports and Tourism, will begin an urgent project to protect the B3 tower in the UNESCO-recognised Mỹ Sơn Sanctuary from collapse before the rainy season kicks in. Deputy Director of the provincial department of Culture, Sports and Tourism Hồ Tấn Cường said an emergency fund of VNĐ1.5 billion (US$66,000) would be used to reinforce the foundations and structure of the tower, which has been in poor condition for years. Director of the management board of Mỹ Sơn Sanctuary, Phan Hộ, said many cracks were found in the tower, some up to 6m long, 18cm wide and 1.2m in depth. The tower is subsided 3 degrees to the south-west. Hộ said the tower, which is close to the B1 and B4 towers, was surrounded by the Khe Thẻ stream, and as such artesian water ran through the B3 tower. The tower was found to be slanting in 1990 by Polish archaeologist and architect Kazimierz Kwiatkowski, known as ‘Kazik’. Its foundations were strengthened by cement and supports.